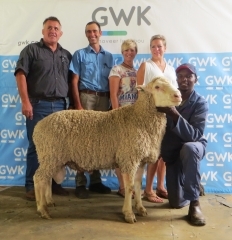 At Konsortium-Merino's 30th sale, 18 February 2016, this ram fetched the highest price ever paid for a Konsortium ram: R80 000. At Konsortium-Merino's 32nd production sale all 353 rams were sold at an average of R8 418 to better their current SA record for turnover to R2 971 400. 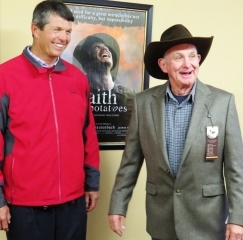 Angus Buchan, parading his 100% proudly South African, Konsortium-Merino wool jacket, with joy. The Konsortium team welcomes you to their world: the vast, open plains of the Karoo, where they breed top Merino sheep with great pride and dedication. This barren area of South Africa is known for its droughts and extreme temperatures. The summers can be upward of 40°C and the winter temperatures often plummet well below freezing point. It is in these harsh conditions that Konsortium-Merino comes into its own. This Merino has the ability to make a profitable income under extensive conditions. Throughout South Africa, many farmers are achieving success with the Konsortium-Merino and they keep coming back for more - time and again. As your area and its nutrition plane improve, so too the productivity of the Konsortium-Merino, without the micron blowing. Come and share today in the vision of the Konsortium team. Experience their enthusiasm and passion. Walk the road along which their Merino dreams are realised. The Konsortium-Merino breeders are fine-tuning the ideal dual-purpose Merino – a sheep with a large carcass and medium to fine wool of quality. It is fertile and able to adapt countrywide. Their farming statistics, content clients and a countrywide demand for their plain-bodied Merinos confirm that they are on the right track. • Konsortium-Merino uses Mother Nature as chief classer and breeds a sheep which is adapted accordingly. All content copyright © Konsortium-Merino 2019.